Steven N'Kemboanza Mike Nzonzi is a French professional footballer who plays as a defensive midfielder for Spanish club Sevilla and the French national team. Steven Nzonzi was born on 15 December 1988 in La Garenne Colombes, France to French mother and a Congolese father. He holds a French nationality having a Conglose ethnicity. He played junior football for clubs such as Racing Paris, Paris Saint Germain, CA Lisieux, Caen, Beauvais, and Amiens. 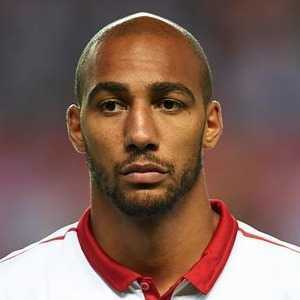 Currently, 29, the French midfielder, Steven Nzonzi stands at height of 6 feet 6 inches tall. Talking about his personal life, he was previously married to his wife, Lynda N Zonzi with whom he married in 2013. The couple got separated in 2017 due to personal differences. He was involved in a collision with a cyclist in Hale, Greater Manchester and stood trial for alleged assault on his wife. He was later cleared of the charges in December 2015. His annual salary is around €1.3 million with a weekly salary of €25,000 which he earns from playing for Sevilla FC and has a market worth in the region of €30 million as of May 2018. Looking at his professional playing career, his net worth is estimated to be around $8 million.